In the event of a nuclear explosion in the capital, Winchester’s location about 70 miles from Washington would put it outside the fallout zone, often estimated at 50 miles. At the same time, employees could easily travel to Washington when they need to. The FBI chose Winchester, a city of 26,000, over other places of similar distance from Washington for a big centralized archive that by 2009 will employ at least 1,200 people, many of them now working in Washington and Baltimore. Some employees already are working in a temporary center outside Winchester. Meanwhile, FEMA has chosen a farm just outside town for an operations center that will employ 700 people. Local officials say it will include positions moved from Mount Weather, the government’s hilltop emergency center on the border of Loudoun and Clarke counties. The trend is happening elsewhere in the region as well. Outside Martinsburg, W.Va., the Coast Guard is building a National Maritime Center, a 200-person office currently in Arlington County. In Washington County, Md., near Hagerstown, the government is redeveloping the vacant Fort Ritchie to house national-security jobs. Advocates of “smart growth” argue that moving government jobs to the valley will cause sprawl and warn that the growth could threaten the rolling Piedmont that acts as a buffer between development in Northern Virginia and the Interstate 81 corridor. Federal officials defended the moves. “For any government agency looking at a new facility in this day and age, of course, security is going to be a priority,” FBI spokeswoman Cathy Milhoan said. The shift already is having an impact on the valley. Real estate agents and developers are buying up land along the half-dozen highways that ring Winchester in anticipation of contractor jobs and other activity that they expect will follow. Olmert, Aliza Ehud Elmert’s leftwing, Peace Now leftwing artist wife is openly critical of his policies – and had never voted for him until this year. (IsraelNN.com) Relations between Israel and the Bush administration have worsened to the point that the United States has blocked arms and technology transfers to Israel the past three months, according to the authoritative Mideast Newsline. The report quoted unnamed sources in both countries that relations have soured since the Hizbullah terrorist war last summer. The U.S. was expecting Israel to fulfill its announced intentions of beating back Hizbullah and rescuing two kidnapped IDF soldiers. American Secretary of State Condoleezza Rice had stated that there would be no ceasefire until the soldiers were returned but had to back down after Hizbullah withstood an Israeli offensive and killed and wounded dozens of soldiers. The Americans also have expressed disappointment and even anger for anti-terrorist incursions that resulted in a high number of civilian casualties in Lebanon and in the Gaza area. Our sources report that the Israeli prime minister is casting about for ways to rush the promised concession through the government ahead of the Muslim Feast of Sacrifice Wednesday, Jan. 3, 2007. The step is likely to face substantial opposition from ministers and the public. DEBKA counter-terror sources disclose that the bulk of the 150 prisoners agreed upon are Fatah loyalists of the Palestinian leader, plus a few terrorists belonging to the Democratic Front and other small groups. The main two problems with this deal is that Abbas cannot promise any help to free Gilad Shalit from Hamas hands in the middle of their factional war, and Olmert cannot pretend that any gesture of support for Abbas will. Furthermore, Israeli military and intelligence chiefs say that nothing will avail Abbas. Therefore, any concessions in his favor will do not good and are just exercises in public relations for external and internal consumption. Finally, the automatic guns and ammunition which Israel made available to support Abbas’ Palestinian Authority forces are likely to reach the wrong hands. Sunday, Dec. 24, Israeli intelligence discovered that Abbas’ lieutenant Muhammad Dahlan, who took charge of the arms, is in Gaza working on a deal for the al Qaeda-affiliated Islamic Army group to join forces with Fatah against Hamas. The Islamic Army, headed by Zakaria Durmush, was part of the terrorist team which kidnapped Shalit six months ago and is an active participant in the daily Qassam missile barrage against Israel. Just How Big Was America’s Real Deficit? Official figures say the U.S. had a $248 billion budget deficit in 2006. In truth, the number is over 10 times worse. Everyone knows America is in debt—but few realize how much. The debt is so deep, the government will never pay it off. It continues to spend more than it collects every year, far more than it even reports. The government officially reports that in the fiscal year ending Sept. 30, 2006, for example, it was in the red by $248 billion. A closer look at the real books reveals the deficit was actually an unimaginable $4.6 trillion. That’s right, just for this past fiscal year. So how can the government get away with reporting a “mere” $248 billion deficit? “The trick,” says Williams, “is that the Treasury essentially steals [incoming] Social Security taxes, without accounting for any offsetting Social Security liability.” Official numbers are based upon “cash accounting” and do not factor in known future costs such as Social Security or Medicare. Under this accounting procedure, the government counts incoming Social Security not as people’s savings, which it actually is, but as general revenue, disregarding the fact that the government has promised to pay it back to retirees in the future. Cash accounting obviously makes the government’s financial situation appear much healthier than it really is. However, just because the government and most media outlets stick to the $248 billion figure doesn’t mean America’s actual debts are not accumulating. In fact, sneaky government budget reporting has allowed the nation to accrue debts that would have caused a massive uproar had the truth been widely reported. On a gaap accounting basis—which includes government promises such as Social Security, Medicare, pensions and all other non-reported liabilities—the total U.S. government debt is now $53.1 trillion, says Williams. Yet, if America’s finances are in such dire straights, why isn’t more fuss being made about it? Why haven’t media personalities and financial experts trumpeted the fact that America is headed toward bankruptcy? Perhaps a more sinister explanation is that the government does not intend to fully repay all its liabilities. At least one of the government’s own accountants thinks this is the case. To explain why his office did not include Social Security and Medicare in the government’s official budget, then acting director of the president’s Office of Management Budget said it was because they do not “represent a legal obligation because Congress has the authority to increase or reduce social insurance benefits at any time,” reported USA Today on August 4. Gimmick book-keeping and poor deficit reporting aside, America’s true debt is rapidly increasing. Eventually, America will find that there are no more easy lenders and that its debts will have to be paid. When that day comes—and signs like a sliding dollar indicate that it is nearing—inflation will soar, interest rates will jump and the economy will take a severe hit. IS BARACK OBAMA A MUSLIM ???? Many months ago, readers began asking me whether Barack Obama is Muslim. Since he identifies as a Christian, I said, “no,” and responded that he was not raised by his Kenyan father. But, then, I decided to look further into Obama’s background. His full name–as by now you have probably heard–is Barack Hussein Obama, Jr. Hussein is a Muslim name, which comes from the name of Ali’s son–Hussein Ibn Ali. And Obama is named after his late Kenyan father, the late Barack Hussein Obama, Sr., apparently a Muslim. Obama’s father died in a traffic accident in Nairobi in 1982, but while Obama was working in Chicago, he met his Kenyan sister, Auma, a linguist educated in Germany who was visiting the United States. When she returned to Kenya in 1986 to teach for a year at the University of Nairobi, Obama finally made the trip to his father’s homeland he had long promised himself. There, he managed to fully embrace a heritage and a family he’d never fully known and come to terms with his father, whom he’d long regarded as an august foreign prince, but now realized was a human being burdened by his own illusions and vulnerabilities. So, even if he identifies strongly as a Christian, and even if he despised the behavior of his father (as Obama said on Oprah); is a man who Muslims think is a Muslim, who feels some sort of psychological need to prove himself to his absent Muslim father, and who is now moving in the direction of his father’s heritage, a man we want as President when we are fighting the war of our lives against Islam? Where will his loyalties be? Is that even the man we’d want to be a heartbeat away from the Presidency, if Hillary Clinton offers him the Vice Presidential candidacy on her ticket (which he certainly wouldn’t turn down)? NO WAY, JOSE . . . Or, is that, HUSSEIN? 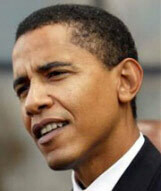 Posted in Uncategorized | Comments Off on IS BARACK OBAMA A MUSLIM ???? As George W. Bush enters his final two years in office, he may be preparing a doctrine of defeatism authored by James Baker and Robert Gates that alienates allies and emboldens enemies. • And the appointment of former CIA official Robert Gates as the new Defense Secretary. “Gates is making excuses for the Iranian nuclear program,” exclaimed Dr. Dore Gold, Israel’s former ambassador to the United Nations and an expert on Gulf affairs. “They are surrounded by powers with nuclear weapons – Pakistan to their east, the Russians to the north, the Israelis to the west, and us in the Persian Gulf,” asserted Gates. He did not bother to explain that Iran’s pursuit of nuclear weapons scared Saudi Arabia and Egypt much more than Israel’s reputed nuclear arsenal. He also did not comment on Egypt’s recent advancement of its own nuclear power plant ideas. Gates also did not explain that Egypt and Saudi Arabia are expected to seek their own nuclear weapons, if Iran succeeds in producing them. Most Israeli leaders have icily received the comments of Baker and Gates, who emphasized the need to talk to Iran and Syria, not fight with them. America’s Arab and moderate Islamic allies have also been very cold to the Baker-Hamilton-Gates agenda and have criticized it privately. “As a whole, I reject this report,” asserted Iraqi President Jalal Talabani, referring to the findings of the Iraq Study Group (ISG) led by Baker and Hamilton. “I think that the Baker-Hamilton report is not fair and not just, and it contains dangerous articles which undermine the sovereignty of Iraq and its constitution,” declared Talabani. Both Baker and Gates have signaled their view that America needs to withdraw forces from Iraq, while beginning to talk to Iran and Syria, the two countries most hostile to the United States and to Israel, America’s strongest ally in the region. But it is not just Israel that is upset by the Baker-Gates approach. “The Baker report has 79 sections, and it has something for everyone, but its central thrust is problematic for America’s allies,” observed Professor Eyal Zisser, Director of Middle East Studies at Tel Aviv University. “Iran, Syria, Hizbullah and Hamas have opposed America, and now Baker comes along and says those who supported the United States and its policies get nothing, while those who attacked those policies should be courted,” continued Dr. Zisser. “The fact is that nobody in the region wants the U.S. to leave, but nobody in the Arab world wants to say that publicly,” he said, explaining that a US departure from Iraq would be perceived as a victory for radical Shiite forces—Iran and Hizbullah—as well as extremist Sunni and left-wing forces such as Hamas and Syria. All four—Iran, Syria, Hizbullah and Hamas—are united in opposing the Bush Administration’s democratization ideas, and they have worked hard to subvert the government of Fouad Siniora in Lebanon and the regime of Mahmoud Abbas inside the troubled Palestinian Authority. All four have been involved in continuous terror and weapons smuggling directed against American allies, but Secretary of Defense-designate Gates, during his confirmation hearings last week, could barely summon up harsh words to describe Iranian and Syrian actions. “Iran is already involved in Iraq and, as I suggested earlier to Senator Byrd, could become much more so,” asserted Gates forcefully. “The Syrians have not been helpful in Iraq, but could become much more harmful to our effort,” declared Gates even more forcefully. Gates offered no proof that the Syrians and Iranians were not already doing as much harm as possible. Another problem with the Golan recommendation is that it flies in the face of an American presidential commitment of support for Israel remaining in the Golan, given by President Gerald Ford on September 1, 1975—a secret side letter given to Israel as part of the interim Israeli disengagement from forward positions near Damascus. For their parts, Baker and Hamilton preached about the need to “talk to enemies,” including those who smuggle weapons and help bomb American troops in Iraq, those assassinating politicians in Lebanon and those shooting rockets into Israeli cities. • The US and its allies did not negotiate with Hitler’s Germany, nor with Imperial Japan. • The Soviets, who had diplomatic ties with America since 1933, were not interested in “wiping out” the United States, but in inheriting America after the “inevitable” defeat of capitalism by Marxism. That is one of the reasons that the Soviets were generally rather conservative and indirect in their threats on America, using proxies like North Korea and North Vietnam. When Nikita Khrushchev actually threatened America in the Cuban Missile Crisis, Leonid Brezhnev and Alexei Kosygin removed him from office. • Iran, Hamas and Hizbullah have no ties with Israel, and they make it clear that they want to destroy the Jewish state. Prime Minister Ismail Haniyye of the Palestinian Authority, made this clear in his visit to Iran this week. Perhaps Baker, Gates and Hamilton were not watching. VeriChip: This chip is not Science Fiction, it is real and plans to use it are progressing. This is a picture of the chip being used and how it is inserted – NOW – at a famous Baja Club in the Caribbean. This club is for the worlds elite. It is being used to purchase enmities since there is no place for a wallet in their “modern” swim suits! So the chip serves as “MONEY” The dimensions as shown are 2.1 millimeters deep by 12 millimeters long. AND they are adding GPS capability! They can track YOU! “Can you see that is the same level when you are aspiring to have a nuclear weapon as America, France, Israel and Russia?” he asked, rhetorically, although his halting command of English left some question about his intended meaning. While it remains unclear if this admission was intentional or not, it is a clear deviation from the 50-plus year old policy of nuclear ambiguity. And the manner in which it was stated left Israeli politicians aghast at the verbal ineptitude of the man who presumes to lead the country. Vice Premier Shimon Peres, a major player in Israel’s nuclear program, is currently in Paris and declined to comment on Olmert’s statement. But an senior cabinet minister, hiding behind anonymity, told Ynet on Monday that he doesn’t understand why there is such a commotion over Prime Minister Ehud Olmert’s admission that Israel has nuclear weapons. Meretz-Yahad Chairman MK Yossi Beilin called Prime Minister Ehud Olmert’s comments Monday on the nuclear issue “recklessness bordering on abandon”. “I doubt if this is someone who deserves to serve as prime minister,” he said. MK Arieh Eldad (National Union-National Religious Party) addressed the comment made by PM Olmert confirming that Israel has nuclear weapons. MOSCOW. (RIA Novosti military commentator Viktor Litovkin) – Do you know what the word “Msta” means? If not, you can surf the Internet, and you will find that the Msta is a 445-km river flowing through the Tver and Novgorod Regions in western Russia. This river flows into Lake Ilmen and links it with Lake Mstino. The Msta River basin, with an area of 23,200 square kilometers, is part of the Vyshny Volochok water system. Moreover, the river itself is navigable 134 kilometers from its mouth. However, the word “Msta” takes on an entirely different meaning if you ask a Russian artillery officer about it. He will tell you that the 152-mm Msta-S (index 2S19) is a self-propelled howitzer, and the Msta-B (index 2A65) is a towed artillery system. Both guns are intended to destroy tactical nuclear artillery and mortar batteries, tanks and other armored vehicles, as well as military personnel, air-defense weapons, anti-ballistic missiles and command centers. They can also destroy field fortifications and hinder the movement of enemy reserves miles behind the frontline. These artillery pieces can hit visible targets point blank and from indirect firing positions; invisible targets are also easily destroyed. Msta howitzers and artillery systems are among the Russian Army’s best weapons. The reader may be interested to know that howitzers have an elevation angle of more than 45 degrees and can fire over high obstacles, the way mortars do. Msta-S howitzers, which were quite popular at the international arms fairs in Nizhny Tagil and Omsk, also stole the limelight in Le Bourget near Paris and in the United Arab Emirates. This howitzer caused quite a stir in Abu Dhabi after firing 40 rounds of ammunition from indirect positions at a target 15 km away in the presence of experts from 20 countries. Although the gun layer could not see the target, 38 shells weighing 43.5 kg each hit the bull’s eye, while two others exploded not more than 25 meters away from the target’s center. Any artilleryman will tell you that this is an excellent result because shell fragments will destroy everything within a 25-meter radius. Experts are impressed with the Msta-S howitzer’s high accuracy and rate of fire. This howitzer fires eight to ten shells in 60 seconds, which is more than any other known artillery piece, including the U.S. Army’s M-109 howitzer with a caliber of 155 mm, which is the Msta-S’s counterpart in terms of its specifications and combat designation. Yury Tomashov, who designed the Msta-S howitzer and who received the title of Hero of Labor (and the Gold Star medal) for this achievement, discussed its remarkable rate of fire with RIA Novosti. Tomashov noted that the Msta-S features an automatic loading system. Its 50 high-explosive, fragmentation, cluster, anti-tank, anti-radar and other special-purpose shells are stored on ammunition trays inside the turret. A mechanical conveyor, which feeds them into the breech, can also be used while the gun is being loaded from the ground. Unlike the M-109, the Msta-S can be loaded at any angle of elevation. Its barrel returns to the initial position immediately after firing for greater accuracy and efficiency. Tomashov said U.S. and British soldiers had to sweat it out and carry a lot of shells during the 2003 invasion of Iraq, code-named Operation Iraqi Freedom. The air-conditioned Russian artillery system features an elevator for easier loading. He said the Msta-S crew works inside an armored turret shielding them from shell fragments and large-caliber bullets, as well as chemical and bacteriological weapons and radiation. A special pressurized filter system purifies and decontaminates the ambient air and traps powder gases outside the combat compartment. An airtight jacket encasing the breech also traps powder gases and leaves the air fresh and clean. According to Tomashov, the howitzer’s fire-control system is its main advantage. The system, which receives intelligence and target-acquisition data, operates in conjunction with computer networks and ensures a high firing accuracy. Yury Butrin, general designer of the Uraltransmash holding company, which produces Msta-S howitzers, said the fire-control system also includes a ballistic computer, an automatic laying device, a topographic surveying unit and a GLONASS or GPS receiver for high-precision navigation. This system, which stores data on the ten previous combat missions at minimum, is linked with an observation post and Pchela (Bee)-type unmanned aerial vehicles, as well as A-50 Mainstay early warning and control aircraft similar to NATO’s AWACS planes. The Kapustnik command-and-control vehicle feeds target coordinates into the fire-control system, which then delivers a devastating strike against enemy positions. The Msta-S howitzer can fire 152-mm and 155-mm laser-guided Krasnopol shells and Santimetr semi-active homing shells. The howitzer’s modified 155-mm version can be exported to other countries, including India, which still produces Western European-caliber munitions, a legacy of centuries of British colonial rule. The Msta-S has the same undercarriage as the T-80 main battle tank. Moreover, its 840-h.p. V-shaped internal-combustion engine can run on six types of diesel fuel. The 42-metric-ton howitzer can move through deserts at 60 kph on its 580-mm wide rubber-and-metal treads. Furthermore, it does not require spikes for greater accuracy because the gun-stabilization system resets firing data and target coordinates after each shot. Neither Tomashov nor Butrin were able to explain why the Msta-S self-propelled gun, which was developed in the Ural Region, is named after a river flowing further to the west. Other Uraltransmash experts said the Soviet Defense Ministry’s Rocketry/Artillery Directorate (Russian acronym “GRAU”) had issued a request for proposal (RFP) in the early 1980s and designated this weapons system the GRAU 2S19. However, to avoid mentioning this secret name in everyday life, someone probably decided to call it the Msta either as a reminder of a good vacation that he had spent on the Msta River, or in order to mislead foreign spies. Indeed, why the Msta in the Urals? But the name stuck. Colonel General Zaritsky, head of the Russian Armed Forces’ missile and artillery unit, said the Russian Army will receive about 2,000 new artillery pieces, mostly revamped Msta-S howitzers, between now and 2015. DEBKAfile’s military sources quote two statements by Israeli generals Sunday, Dec. 10 to the Israeli cabinet: OC Northern Command Maj.-Gen Gadi Eisenkott denounced as irresponsible talk of a war with Syria and Hizballah in the summer of 2007. Brig. Gen Yossi Baidatz, military intelligence chief of research, reported that Syria had increased its production of long-range missiles (picture)and was building up its anti-tank rocket units on the Golan border with Israel. This information is not proof in itself of a Syrian intent to go to war. Gen. Eisenkott says he sees no tangible war preparations on the Golan and Hermon despite the aggressive rhetoric coming out of Damascus, whereas it is Brig Baidatz’s job to count the missiles coming off Syrian production lines in the northern city of Homs. The volume in Nov. 2006 was 20% greater than the output of Nov. 2005. The key question neither Israeli officer answers is this: How many missiles are destined for Syrian use and how many for the strategic reserve Iran is stocking in Syria. According to DEBKAfile’s military sources, Syria’s missile output is not determined by the heads of its military industry, but by the Iranian Revolutionary Guards sitting on the industry’s executive boards and incoming investment funds regulated by Tehran. All the departments of Syrian’s military industry merged last year with Iran’s manufacturing complex and are run as a single corporation. Therefore, it may be said that it is very much up to Tehran to determine if and when Bashar Asad goes on the offensive on the Golan front. Asad is not obliged to dance to Tehran’s tune. He can decide he no longer wishes to coordinate his military and diplomatic strategies with Tehran. This would mean the breakup of the close Damascus-Tehran alliance. For the moment, there is no sign of any breach. Quite the reverse; intelligence data indicate a tightening of the partnership on all shared fronts. This again is no proof that the widely-predicted summer 2007 war is inevitable. It does mean that Tehran means to hold on to Syria, Hizballah and Hamas as proxy whips against the Americans in Iraq and Israel until such time as its clerical rulers find a war move expedient. You are currently browsing the Actions By T blog archives for December, 2006.